The population debate is polarized between the view that population is the root cause of our problems, from global warming to environmental destruction, versus the view that human numbers pose no problem at all. Overpopulation denial stems from the fear that human rights would be trampled by a top-own population control and that it would distract us from “more pressing” social justice and economic issues. This polarization is keeping either side from developing an appreciation for the other’s point of view. We may have to get past our Malthusian versus human rights logjam to develop a working holistic solution. It has become a question of values. Do you value other species or humanity most? If you are a humanist, do you value your right to procreate most or the quality of life of your children and the many the most? Growth is good. - Not! Overpopulation is indeed a problem felt most immediately by the majority in the third world. But I often wonder how many first world people do not realize that the U.S., for example, also has an overpopulation problem -- even when they are stuck in traffic jams and surrounded by people constantly. No matter what your cause, it is a lost cause unless we reverse overpopulation. We can’t resolve many of our most pressing long-term problems until we reduce human population. Overpopulation is the engine behind global warming, pollution, peak oil, social injustice and poverty, crime, resource wars, biodiversity crash, deforestation, and drought -- just to name a few. We live in a closed ecosystem, a ball of dirt spinning in space, and all of these issues are related to how many people there are trying to consume a limited amount of resources and spewing out the resulting waste. Yes, the financial crisis is an immediate problem. However, it all comes back to our numbers. If we did not have the numbers we do today and had a much smaller steady-state economy, there would be plenty of resources to go around. The resilience of the planet would be our safety net, but again with our current numbers and mindset we have squandered most of our natural inheritance. Part of me thinks, that people who “get it” should gather in an enclave to become the seeds for new cultures that free nature from her servitude through reducing our numbers and consumption. Starhawk’s The Fifth Sacred Thing poses the “then what,” question. In a post-apocalyptic world northern California has chosen to live within its means while southern California does not, so it plans to invade to take the north’s resources. The dilemma is that as long as our dominant culture is growth oriented, and we live by the story that, “the world belongs to man,” our culture will continue to overwhelm all efforts to reverse our course toward complete crash. We also live in a culture of historical denial. Our Taker culture has spread from the Fertile Crescent to overtake all other native Leaver peoples. In the U.S. we teach our children about our culture’s pilgrims, settlers, and manifest destiny instead of teaching the truth of the theft of the land and genocide of native American people -- a crime on the scale of the Jewish holocaust. Where are the genocide memorials in the U.S. for Native Americans? Why don’t we give the first Americans a billion dollars a year in military aid like we give Israel? Native American people have a lot to teach us that we need to relearn now. In other words, we are not going to see population reduced to sustainable levels by modern Taker culture. If there is a future to humanity at sustainable numbers that enables restoration of the earth’s biodiversity, it will be from new or other cultures, not ours. If we do not reduce our population, nature will do it for us. “Nature always bats last,” the saying goes. We can either remember the successful self-sustaining cultural models of the first peoples that we have nearly exterminated or let nature give us a global Easter Island wake-up call. The first step to get the majority of people to “wake-up” is to develop an appreciation of what our culture has done for the last 10,000 years to our “relations” (all beings). This requires a whole new educational message to the youth to overcome our lack of empathy of the impact of our numbers. It is almost becoming a cultural or educational challenge for us to somehow teach the next generation not to make the same “infinite growth” mistake we made. Maybe the solution starts with telling our children the truth. Environmental generational amnesia is another key reason why most people do not appreciate the impact of overpopulation. We only remember the population and the environment of our lifetimes. We don’t know the world as our great grandparents did, partly because it is dismissed as pre-progress times. Since we have not experienced the past, we don’t complain about the way things are now. As far as we are concerned, things have always been this way. Imagine how you would feel about humanity’s expansion if you were a Native American alive in 1491. Here are a few controversial, but creative ideas try to develop a consensus to reduce overpopulation before nature does it for us in our monocultured wasteland. Some are realistic today, others are intended to open up your mind and stimulate discussion. Start talking about overpopulation. See if you can find a positive way to encourage smaller families, recommend permanent forms of birth control to friends and family once they have their first child, and even consider politely disapproving of larger families. I don’t know about the last one, but it is something to think about. It is difficult to talk about overpopulation because mother culture has been whispering in our ear since the day we were born, “man has dominion over the earth, be fruitful and multiply. The economy needs to grow; a contracting economy is very bad.” Our Taker cultural story is told to us this through media, education, social behavior, traditions, stories, and religion. Our culture insists on growth of both our population and economy. In fact, our modern economic model requires economic growth to pay for the interest on the debt that we are accumulating. The financial crisis today is partly caused and compounded by the end of growth caused by petrocollapse. We are becoming insolvent because to can no longer grow. Growth is actually the last thing we need; our needs cannot be met through growth and destroying the planet. If all other species were equally represented at every stage of public decision making, we would live in a far better world of great cultural and biologic diversity. The concept coined by Joanna Macy in 1985 is a communal ritual in which participants speak on behalf of another life-form. It aims to heighten awareness of our interdependence in the living body of Earth, and to strengthen our commitment to defend it. The ritual serves to help us acknowledge and give voice to the suffering of our world. Simply put, reducing consumption to support nine million, whether by intention or by petrocollapse, is still overpopulation. As I said in my interview on New Dimensions Media, Going Green is Not Enough. Every increase in automobile mileage is squandered by an increase in population. Recycling and installing compact florescent light bulbs manage to make more room for an even larger population and ultimately bigger problems. If you want to play, maybe you have to pay. Start taxing people more for larger families. End the child tax credit—in fact reverse it. I am not saying that you can’t have as many kids as you like, go ahead, but just that you are going to have to pay for what you’re responsible for. More kids means more schools, infrastructure, healthcare, public services, etc. One child should be able to go to public school for free, but after that you pay the actual cost for each additional child. Start this with new children born 12 months from now. Since the agricultural revolution, our culture has been running a food race—have more people, grow more food, have more people, and so on. It is a never ending race that has gotten us to where we are today. Maybe it's time to start reducing food production. Some have said, when famine occurs, send birth control instead of food. I would say, send the birth control and educate women before famine occurs to prevent it in the first place. Limit the importation of food and migration from outside your bioregion or watershed. Once we have to live within the carrying capacity of our region, we eventually limit our population. Immigration is very controversial. My best friend is strongly pro-immigration to help support his bakery business. But, limiting your population within your fixed geographic region was a prime way native Leaver peoples maintained their steady-state population levels for millions of years. Also, if you can’t move to where the resources are, you will have to make due with smaller families and a simpler lifestyle where you are. This is a complex issue that probably needs more discussion. All immigrants here in the U.S. today are engrained in our society. Maybe you draw the line here, and then move on. Communities should consider ending or heavily taxing construction on new sites and just allow replacement of comparable square footage on existing developed sites. Or, allowing the shifting of development rights to concentrate development into pedestrian communities. What good is having a community discussion about “food security” while at the same time continuing to add to the overshoot of the carrying capacity of the same region? In other words, if you cannot feed the people you have, why build more housing and infrastructure for more people? 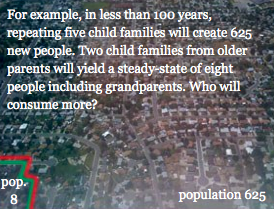 In the image at top of the page, I illustrated that a family of five children for just four generations grows to 625 people, compared to just eight people including grandparents if couples have two kids in their late thirties. Larger families will consume the vast majority of resources in affect taking away from smaller families. Further, if everyone had one-child families, the world population of almost 6.8 billion would drop to 1 billion in a 150 years. Here are the most sobering numbers. Before we started using oil around 1850 there were only 1 billion people on the planet. Today with the easy-to-recover half of oil gone there are about 6.7 billion. In the next few years petrocollapse is going to start to take away the carrying capacity supporting 5.7 billion of today’s global population. Homo fossilus foolus will be extinct by the end of this century. When oil is gone, world population will probably drop well below 1 billion again because our overshoot has significantly reduced the earth’s resilience and carrying capacity compared before Europeans expanded to the Americas. The good news is that the problem is not humanity, it is our Taker culture. Humans have lived on the planet for three million years in symbiosis with our ecosystem and a riot of life. The problem is our agricultural revolution Taker culture. The next stage will come from the new earth cultures being born today. Our duty is, as I said, is to be honest with our children and give them the choice to take control of their future. We have to tell them the truth that our parents did not teach us, that our numbers are not only a threat every other species, but also to ourselves. Ecocity Builders' "Transfer of Development Rights"
I find in reading those sites that say that population problems are a myth that their evidence is very sparse and inconclusive. Recently I read Book 1 of the free e-book series "In Search of Utopia" (http://andgulliverreturns.info), it blasts their lack of evidence relative to their calling overpopulation a myth. The book, actually the last half of the book, takes on the skeptics in global warming, overpopulation, lack of fresh water, lack of food, and other areas where people deny the evidence. I strongly suggest that anyone wanting to see the whole picture read the book, at least the last half. future for the human race! ... therefore life is a learning experience called evolution! We can find a solution for this problem but, it will definitely go against our values and principles. There is really only one glaring error in this. This is native romanticism. As soon as Homo sapiens left Africa 70,000 years ago, we became an invasive species. Pre-colonial cultures all around the world do not practice sustainability, they practice lower birth rates and quicker and more frequent death rates. Early peoples burnt down forests, causing death to all animals, in order to gain access to pit. They built pits in which herds fell into, or off cliffs, early Homo sapiens built spear throwers which allowed us to kill remotely, at a distance, greatly reducing personal risk. First Nation people in North America numbered less than 2 million at the time of colonisation. In Central and South America, native peoples numbered 20 million by the time of colonisation, but they had already seen several civilisational crashes which were already back then due to overpopulation. In Europe, when the Basque and the Portuguese came for fish off the Grand Banks of Newfoundland, it's because fish back home had already been overfished and decimated... not because people were fattening themselves on fish, but because there were TOO many people eating fish... too many humans. At the time of European colonisation, the population of Europe was also in the 20 M ballpark, already overpopulated. When Homo sapiens got the technology to kill remotely, we climbed to the very top of the food chain, with our position at the top of the food chain, our population should be similar to that of any other large predator population, before they were exterminated of course. The Earth can SUSTAIN less than 0.2 billion people in order that other species on Earth may also have a chance. Native romanticism will get us nowhere. We need universal solutions, not romantic ones.